New series by Taisia Korotkova devoted to the first book of Ovid's "Metamorphoses", narrating about the creation of the world are shown at Schloss Pornbach in Germany in the frames of group exhibition. Taisia has created several paintings in the ancient icon painting technique she is working with. Two landscapes, of Earth and Mars, are tempera paintings on wooden panels. The artist makes all preparations herself, including making gesso on classical prescription, preparing colours from pigment, egg yolk and white wine, and then covering the finished work by boiled linseed oil and varnish. Alongside with tempera on gesso paintings, Taisia Korotkova has created objects, reflecting different chapters of Ovid's book. DiERenKUNST - 25.05.2017 - 15.10.2017, Kasteel d'Ursel, Hingene, BE. NK Gallery joins Antwerp Art Weekend with the opening of Didier Mahieu solo exhibition "The Enactment of the Stone". Special event: 15.00-18.00 Sunday 22 May, 2016 - interactive performance by Didier Mahieu. External event: exhibition of Stief Desmet sculptures in the space of Old Military Hospital. Location: PAKT, Regine Beerplein 1, Groen Kwartier/ oud Militair Hospitaal, Artsen zonder Grenzenstraat. 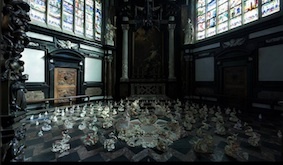 "Ou sont devenu les fleures..."
Oleg Matrokhin presents his expressive installations initiating the dialogue between the contemporary art and sacred space of the cathedral. 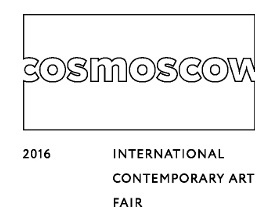 NK Gallery presents 'SPACE MUSEUM SERIES' by Taisia Korotkova (°1980, Russian artist, lives in Milan, IT), solo project, specially created for the art fair. Taisia Korotkova (°1980, Russian artist, lives in Milan, IT° works in hyperrealist style using egg tempera on gesso, the unique icon painting technique. This very old method, which demands considerable technical knowledge and skilled craftsmanship, creates a strong contrast to her paintings' subjects: new technology and science. Highly appreciated by Russian and European art professionals, she was awarded Kandinsky prize and participated in 3rd and 4th Moscow Biennale of Contemporary Art. 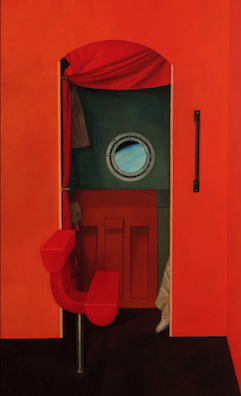 Works by Taisia Korotkova are shown in Russian and European museums and included in public collections, among others in Moscow Museum of Contemporary Art. SPACE MUSEUM SERIES is devoted to the well-known MIR Space Station and tells about the second life of scientific and technological items. Created for conquering the open space, they are now stored as museum artefacts in special surroundings. It is this strange, but clearly perceptible life that the artist tries to capture in her paintings. Marina Abramovic, Michel Balzy, George Brecht, James Lee Byars, Pierr-Laurent Cassiére, Marion Catusse, Marine Class, Hubert Dupart, Jean Dupuy, Paul Armand Gette, Isabelle Giovacchini, Guillaume Gouorou, Laurent Grasso, Alicja Kwade, Didier Mahieu, Aurelien Mauplot, Eric Michel, Damian Ortega, Eve Pietruschi, Emmanuel Régent, Evariste Richer, Jean-Philippe Roubaud, Bettina Samson, Valentin Souquet.